This race holds a special place in my heart as it was my first Ironman back in 2003, the inaugural year for Ironman Wisconsin. The scenery, people, support and backdrop of this race are amazing. From my experience racing Ironman Wisconsin twice, as well as analysis of past age grouper files, here’s how to nail it on race day. A single loop swim course in Lake Monona, the water temperature is usually cold enough for wetsuits, but if they have a hot summer and fall, be ready to ditch the wetsuit. The start is in deep water, so once you get in you’ll need to swim or tread water. The lake is large enough to accommodate the full field so don’t be overly concerned about crowding. Ironman Wisconsin has the most unique transition zone of any race. Set up on the top level of a parking structure attached to the Frank Lloyd Wright designed Monona Terrace, athletes will run from the lake to the lower level and run up three stories via the winding entrance road, known as the Helix. It’s a long run, but a cool one. Once on the bike you’ll go out the other side, riding down the Helix before shooting out onto the course. It’s lined with spectators and the coolest transition you’ll ever be a part of. Three words describe this two loop course: hills, hills and more hills. This course will test your ability to pace yourself. Using a power meter or heart rate monitor will allow you to set your correct effort level to ensure an even bike ride. In your training, determine your Functional Threshold Power, (FTP) or Lactate Threshold Heart Rate (LTHR) using the method found here. Once you have your FTP or LTHR, use the table found in this article by Joe Friel to determine what your effort should be. In 2012, age grouper Lynn Braun raced Ironman Wisconsin and did an amazing job pacing the bike. Looking at her power file, she actually averaged nine more watts on the second loop than the first when you look at her Normalized Power. This is in stark contrast to many who go out too hard for the first loop and pay for it on the second. On any hilly course, riding at a fast cadence of 90 rpm or above will save your legs for the run. Again, Braun did a textbook job of using a high cadence rather than muscular power to keep her power up. Her average cadence was 92 rpm for the entire ride. Athletes would be well served to make sure they have low enough gearing to spin up the hills, especially on the second lap. Also, make sure your rear derailleur is in good working condition before the race as it will get a lot of use on this course. Braun did have many power spikes throughout the ride. Her Variability Index, or V.I. shows a 1.09 where Training Bible author Joe Friel likes to see 1.05 or less. VI essentially measures how “smooth” your power output is for a ride, and a VI of 1.0 indicates a perfectly smooth ride where Normalized Power (NP) equaled Average Power. Where NP differs from Average Power significantly, this indicates that the ride included many power surges and was thus muscularly taxing on the legs. Age grouper Peter Moeschler covered the 112 mile ride in 5:40:54 and recorded a VI of only 1.02. This is an incredibly smooth ride for a course that is so hilly. Moeschler did push the bike pace a bit. His Training Stress Score, or TSS for the 112 miles was 309 and his Intensity Factor, or IF was .74. 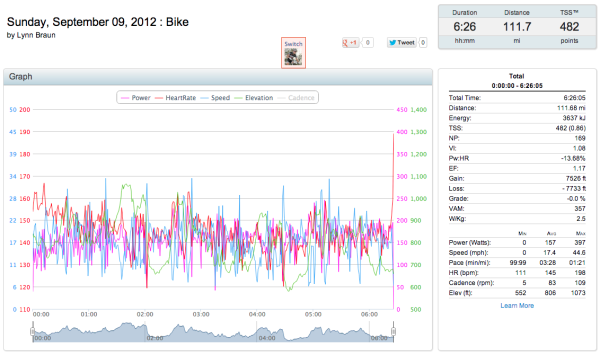 TSS quantifies workload based on the duration and intensity of the session. Friel recommends targeting a TSS of 260-285 on the bike for most age groupers. 309 TSS puts Moeschler right on the cusp between Friel’s recommended effort for a strong, proven Ironman runner, or possibly overdoing it. Since Moeschler put down a solid 4:03:08 marathon we can conclude that he may have pushed a bit too hard on the bike, but not by much. Riding up the helix and into T2 is one of the most unique experiences you’ll have. It’s short and packed with spectators so you’ll barely feel the incline. Much like the bike, the run is two loops and is constantly going up or down. Running through Camp Randall, where the Wisconsin Badgers play football, and down State St., the main drag downtown, continues the theme of unique experiences. Crowd support is unbelievable for the entire course. As with the bike, pacing the first miles is very important. For her part Braun did a great job of keeping her pace steady. Her mile splits are mostly within 30 seconds of each other. Plus, her fastest miles come at mile 14 and 15, meaning she went out at a pace she knew she could handle. Be ready for the hills, especially the downhills which can do some big time damage to your quads. Work to keep your run cadence at 90 or above as that will help you be lighter on your feet, reduce damage and give you the same speed at a lower effort. The weather in Madison can be unpredictable. They’ve had cold and rain and extreme heat. Definitely take a look at the forecast before you pack your bags and bring all appropriate clothing. Ironman Wisconsin is a great venue with many unique features. From the spiraling entrance into transition to running through a large football stadium, it offers more than just the miles you cover. The hills are constant, so pace yourself accordingly. Pace yourself right and use a good cadence on the bike and you’ll be set up for a solid run. Finishing with the State Capital lit up in the background is an awesome feeling and one that you will always remember.